Seneca Falls, N.Y. – Every August the Rodman Lott and Son Farms&apos; family in Seneca Falls, NY, makes 300 acres available for the largest outdoor agricultural trade show in the northeastern U.S. The exhibits and demonstrations at the show are not just for farmers but for anyone interested in rural living. This year&apos;s event is set for August 7-9, 2018. There are opportunities to learn about raising beef cattle and about the proper care of horses and other equines. This year&apos;s show features a different horse rescue program each day with live animals. On Tuesday, come learn about the work of the Finger Lakes Thoroughbred Adoption Program in presentations at 11 am and 2 pm. 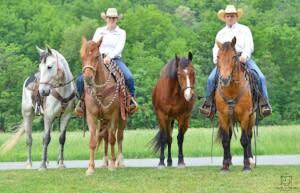 On Wednesday, the Wild to Mild American Mustangs are here with trainers Jack and Emma Minteer of Rose Hill Ranch. On Thursday, Begin Again Horse Rescue will have miniature horses on site and talk about their work to rehabilitate horses of all sizes, donkeys, and mules. Live animal demonstrations include cattle handling demonstrations with live beef cattle. Alpaca owners are on site with animals, fiber products and may be demonstrating spinning to make yarn when you visit their exhibit. Want to attract butterflies to your yard? The crop demonstration plots planted for the 2018 Empire Farm Days at the farm at 2973 State Route 414 include new options for attracting butterflies and pollinators as well as summer heat-tolerant species and crops for livestock forage. Interested in growing grapes or hops to make your own craft beverage? The Craft Beverage Center includes vendors and a daily 10:30 am program on how the spotted lanternfly invasive species impacts grape and hops crops. Got land covered with rocks or brush you would like gone? See what a commercially available stone grinder and forestry mulcher built by a farmer can do. Test driving at the show includes the opportunities to get behind the wheel of large farm equipment, trucks, construction equipment, and UTVs. FFA youth compete in the state-level tractor driving safety and welding competitions on Thursday. The New York State Department of Agriculture and Markets, USDA, NY Farm Bureau, and New York State Grange are among the hundreds of exhibitors at this show. Even the farm pond gets in the act. Bring an extra set of clothes in case you fall in trying a pedal-drive kayak or standup paddleboard on the pond with Morgan Marine. New York Sea Grant, the US Coast Guard Auxiliary and New York State Marine Services Bureau offer safety lessons before you put your life vest on. Admission to the show is free, parking is $10 per vehicle. Learn more and find daily schedules, photos, and maps online at www.empirefarmdays.com and on Facebook and Instagram. Photo: The Wild to Mild American Mustangs of Rose Hill Ranch will be the featured presenters at the 2018 Empire Farm Days on Wednesday, August 8 in Seneca Falls, NY.